The Mazda ND MX-5 is the latest evolution of the Miata chassis. We have found it to be an excellent handling car, one of the best and most well balanced cars we have driven. We have, however, found the car to be too soft in completely stock form to really be fun. When we drove the MX-5 Cup race car, we found ourselves wishing that the race car's suspension was available as a factory option for the street car. The MX-5 cup car is taught, well balanced and even though it's a race car, has a reasonable ride. In search of improving the MX-5 in the same way, we obtained a set of HKS Hipermax SP coilovers for the MX-5 for evaluation. Previously we were pretty impressed with the Hipermax SP on a Honda S2000 and we hoped to have the same results on the MX-5. HKS says that the Hipermax SP is set right out of the box with a dialed in setup for damping and ride height which is great for those who are not experienced with setting up suspension. Will we experience the same results we enjoyed with the S2000 on the MX-5? Lets get to work installing the stuff and see! 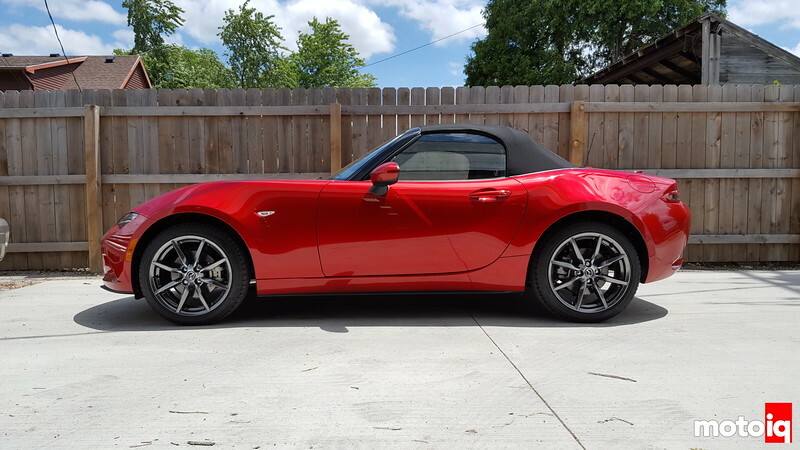 We took this before photo to show what the ND MX-5 looks like at stock ride height. 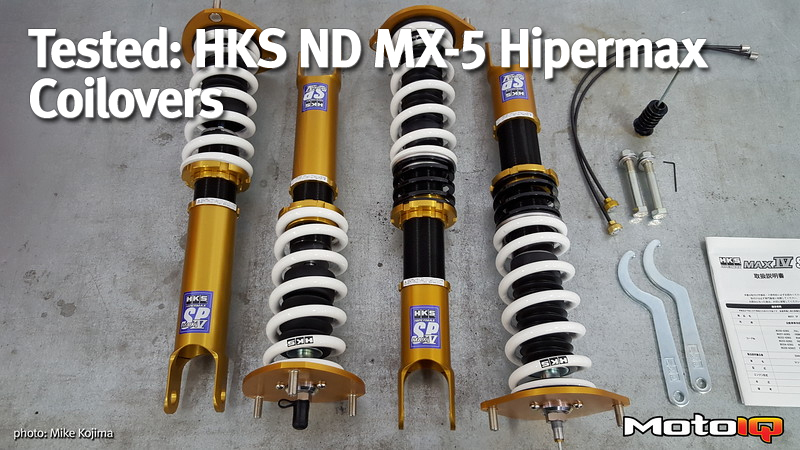 As set from the factory, the HKS Hipermax SP coilovers will drop the front of the car 45mm and the rear 40mm. We used Pure Tuning, an HKS Pro Tuning shop to do the installation and alginment of the car. HKS has two Hipermax lines, the SP and GT. The GT Model is more street oriented, but can still be adjusted to work fine on the track. The SP is much more aggressively calibrated and is intended to be a daily drivable and track capable shock. 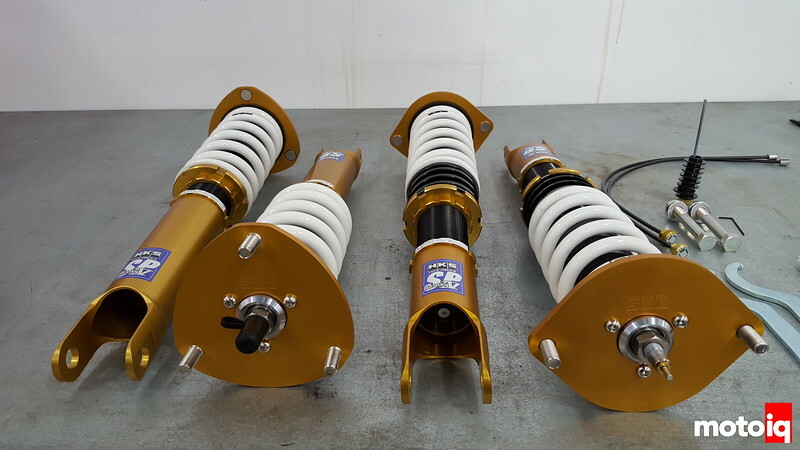 We have liked the SP coilovers more in the past as they are designed as something users like us would enjoy. Despite a more aggressive calibration, we have found them to be fine in daily street use. The Hipermax SPcoilover for the ND MX-5 Miata is a gas charged monotube damper. The damping is single adjustable with 30 clicks through the adjustment range. The knob's adjustment is biased toward the rebound side although adjustment does alter the shock's compression too. The dampers' bodies are threaded for spring preload adjustment and the body fork is threaded into the lower part of the anodized billet aluminum shock body. This allows ride height adjustment to be independent of the spring preload. The front shock assembly is shown here and you can see that it has a main spring only. 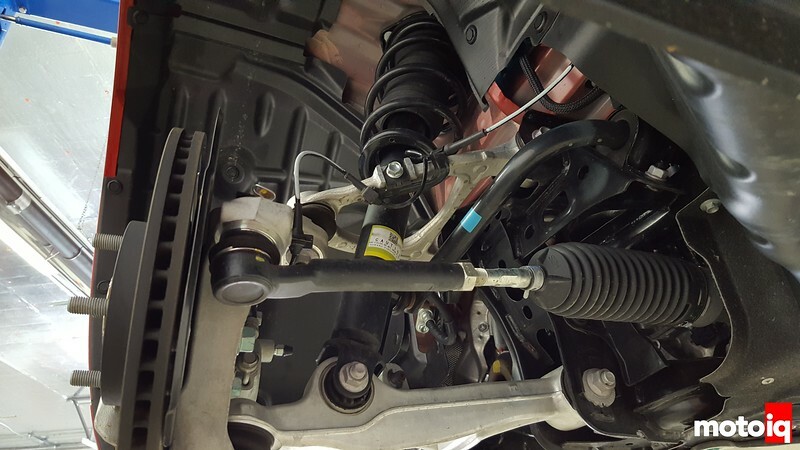 The rear shocks have a main spring and tender spring. The Hipermax coilovers have OEM like dust shields for a long service life in all weather conditions. The threaded part of the shock body is treated with a special coating called PNE. This is a special plating that is self lubricating and is 5 times more corrosion resistant than traditional zinc plating. This will help prevent seizing of the spring perches. The Hipermax SP also features a large diameter shock shaft. This helps displace more fluid under shock movement causing more fluid to flow through the shock's valving. This helps create more damping force, especially critical low speed damping force, while also improving the valving sensitivity. The ND front suspension is straightforward geometry unequal length A arms. This a great setup and we wish other manufacturers would look to this instead of weird multi link designs for inspiration. The front shocks have a really soft spring rate of 2.4 kg/mm. Considering that this is an A arm type suspension with inboard mounted shocks, this is amazingly soft for a sports car. You would expect these sorts of spring rates on a McPherson strut equipped crap box econo car. 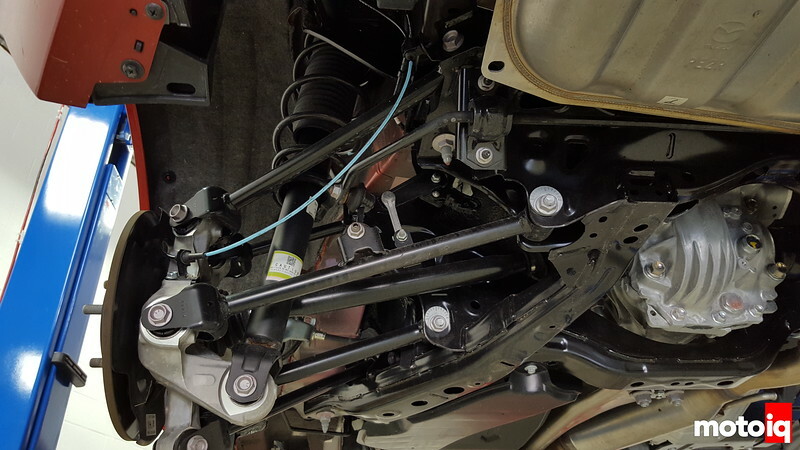 The rear suspension is a multi link designed for passive toe control. The geometry is fairly straightforward but we wish the unequal length A arm theme continued to the rear of the car as well. The rear shocks are also very softly sprung at 1.9 kg/mm. Again very surprising considering that a multi link puts some leverage against the shock reducing the actual wheel rate.